I'm an ENFJ. For those of you that follow personality tests and self-reflection exercises, those initials come from the Myers-Briggs. That E in the front reflects Extroversion, and I am just barely (by one tiny point) an extrovert. Depending on the setting and mood I'm in (smile), I can gain a lot of energy from being with people. And on other occasions, I become quickly tired by groups and crowds. In the big, loud culture of the United States, I find myself longing for silence. 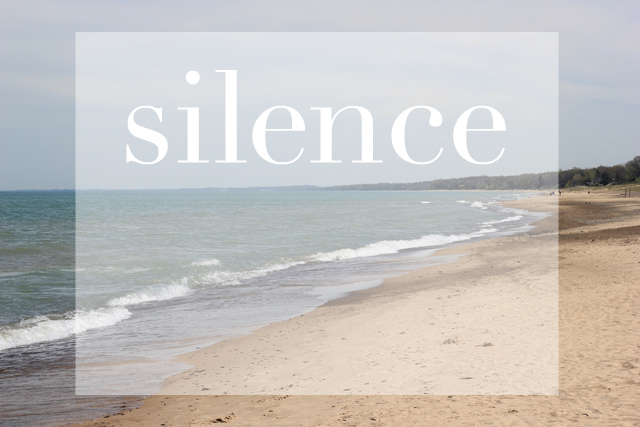 I once spent three days in complete silence - by choice. A friend and I drove down to the Trappist Monastery in Kentucky. We had decided to stay with the monks as guests for three days and follow along their daily rhythms. By that I mean, no speaking, sunrise/noonday/sunset/evening prayers, and simple community meals. For the first 24 hours I thought I was going mad. The need to say something - anything - seemed bigger than I could squelch. This time away predated the rise of the smart phone, but I still felt the urge to fill the silence with the radio, my own hummings, even noises from my simple guest room furniture. As the monks informed us upon entrance, it usually takes at least 24 hours to quiet your mind. My first day was much less peaceful and relaxing than I had imagined. But by day two I felt my body accepting the softness of silence. The quiet was healing. Giving myself the time to be in my own skin. What are your thoughts on silence? What role does silence play these days? If our hearing is not already filled up with TV ads and shows, new albums from the latest bands, phones that beep/buzz, where can the silence come in. I am slowly teaching my children to appreciate the quiet ouside of themselves in order to find the quiet inside. Could you do it? Remain silent and quiet for an afternoon? A day? A week? Perhaps it's what you've always wanted or your worst nightmare.